My mailbox has been very happy lately! Here are a few of the wonders sent by pen pals and Postcrossing friends. First, a marvelous creation by mail artist Sally Wassink. On the outside: “Burn on completion” and “2016” stamped in red, and Sally’s “Wurlitzerworld January 1, 2016” postmark. With the bottom stapled, it folds and tucks just like a matchbook. Ingenious! Carrie, a Postcrosser from Minnesota,made me a gorgeous stamp-art postcard with an inspiring message for the new year. The stalk / flowers on the right are embossed with gold ink. LadyOla, a Postcrosser from Belarus, was sweet to note from my profile that I adore triangle stamps! She used this one on my postcard — it looks like a fragment of a tapestry, doesn’t it? Ceejay, another treasured pen pal I met through Postcrossing, sends me her own beautiful photo cards with wonderful gifts tucked inside, often precious triangle stamps she finds for me! And last but not least – a Postcrosser from the Netherlands made me this extra-special card with sequins, real lace, and a pop-up cuppa tea and flowers! Have you sent or received any mail art lately? I hope your mailbox has many happy days in 2016, both outgoing and incoming! 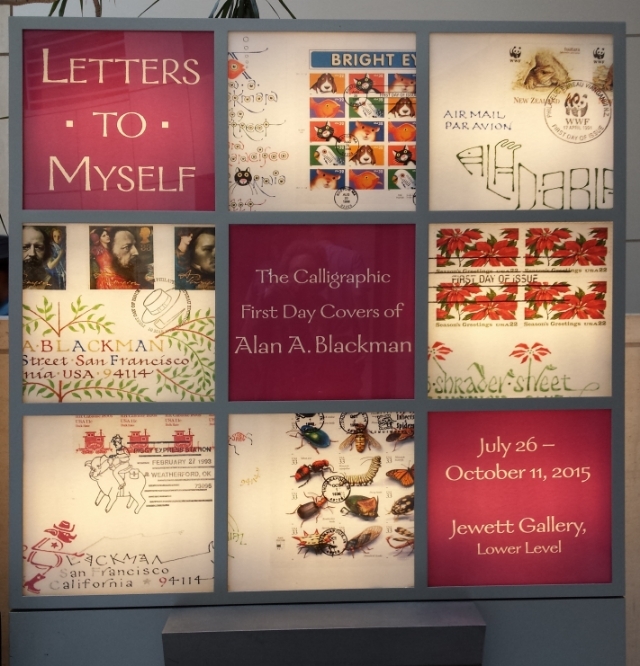 If you love calligraphy and mail, envelope or lettering art, you have until October 11th to see the do-not-miss exhibit “Letters to Myself: The Calligraphic First Day Covers of Alan A. Blackman” at the Jewett Gallery on the lower floor of the San Francisco Public Library. 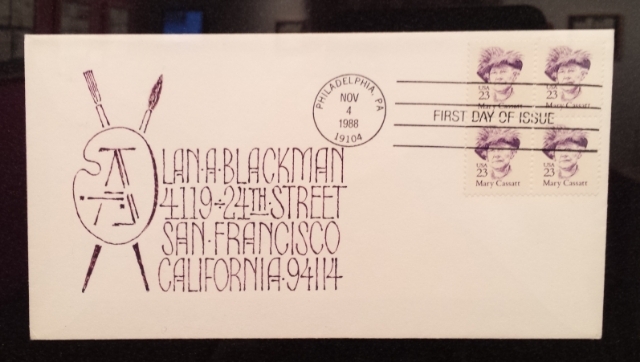 Alan Blackman, master calligrapher, letter artist, teacher and font designer, shows us 200 hand-decorated envelopes from his collection of a thousand which over 40 years he sent to himself and to his late son Stephen, to whom the exhibit is dedicated. Some illustrations are relatively simple – a US stamp honoring painter Mary Cassatt. Others deceptively simple – an achingly beautiful portrait of a swan rendered with a few deft strokes. 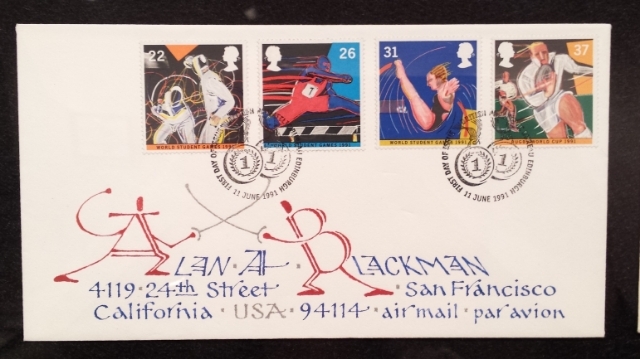 The envelopes, some grouped by theme, include first-day cover postage stamps from the US, Canada, Great Britain, and several other countries. And the artful rendition of the lettering, with such widely varied subjects as inspired by the stamps, is staggering in its creativity. On my second visit I was rewarded by a glimpse of the talented Mr. Blackman himself, deep in conversation with several admirers. 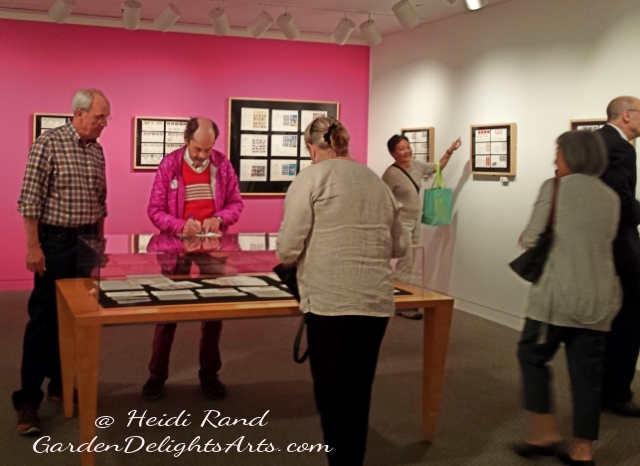 I’ve shown you just a few of my favorites, please go see them all for yourself. 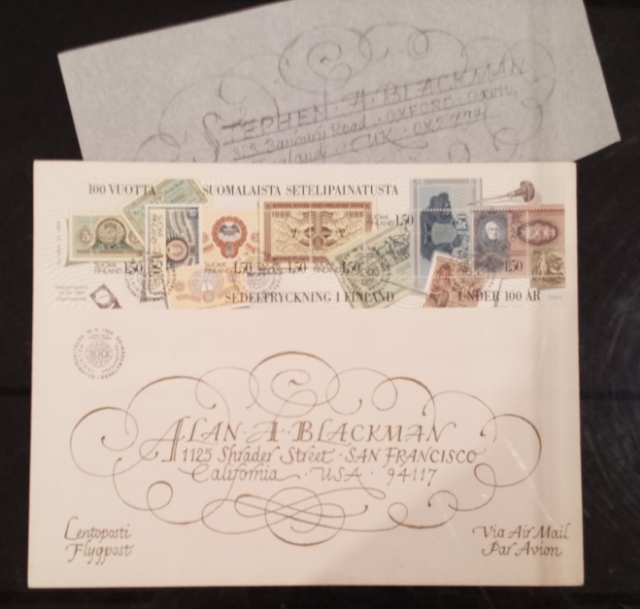 For non-locals, you can see the envelopes online at Mr. Blackman’s website. And click here to read Sam Whiting’s excellent article and interview with Mr. Blackman in the San Francisco Chronicle. You oughta know by now what Holiday Time O’ Year means on my blog! Without further ado, two of my favorite vintage postcards to celebrate Christmas. In 1905 Ruth from Rhinebeck New York sent this beautiful embossed postcard, a harp adorned with holly and mistletoe, to “Miss Hattie Buck” of Weissport Pennsylvania. Following the instruction printed on the back of the card: “This side is exclusively for the address,” Ruth wrote nothing else. Finally, not nearly as old but equally fabulous, this Christmas stamp issued in 1967 was designed by Howard C. Mildner. The stamp shows part of the oil painting “Madonna and Child with Angels,” by Flemish artist Hans Memling. I’m smitten with the Art Nouveau typeface. You can see my Christmas vintage postcard blog post from last year here. And here is my 2012 post.